In Toronto I brought together a “Downtown Dialogue” at the Board of Trade – a precursor of the King-Bay Chaplaincy. As Dean of Montreal I was the chief negotiator for the church on a $180 million redevelopment of the Cathedral block, providing income for the future of the Cathedral and for ministry throughout the Diocese. By virtue of my office as Bishop I am President of The Fulford Residence for seniors and a Visitor of Bishops University. Christian-Jewish dialogue has been a major involvement, resulting in the award of the Jerusalem Prize by the Canadian Zionist Federation, and the Alan Rose Award for Human Rights from the Canadian Jewish Congress. I have participated in the life of the wider community and developed relationships of both collaboration and challenge with the last five Quebec Premiers. I have been a strong supporter of the Reseau Francophone (Francophone Network) of the Anglican Communion, and serve as its Honorary Chairman, succeeding Archbishop Michael Peers. I have served as a Governor and Trustee of Lakefield College School. My role as Bishop Ordinary to the Canadian Forces for the past 7 years has been richly rewarding, taking me to bases across Canada in support of our young men and women in uniform. Thirty five Anglican clergy serve as full time chaplains – a larger number than in many of our dioceses. Our direct relationship with the Minister of National Defence as members of the Inter-faith Committee on Canadian Military Chaplaincy is a unique direct line for the Church to the federal cabinet. I have served on the National Executive Committee, and the Council of General Synod. 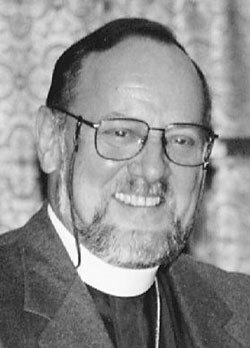 I was chairman of the Stewardship and Financial Development Committee of the National Church, and have served on the Information Services Committee, and as a member of the Board of the Anglican Journal. On both sides of my family we have been Anglicans actively involved in the life of our church for at least five generations. My own formation as a Christian was nurtured through six years at an Anglican boarding school at Lakefield, Ontario. As a young man I was active in the Anglican Young People’s Association, ending as Missionary Projects Chairman of the Dominion Council. I organized and led the first young peoples’ work camps in the Dioceses of Keewatin and Moosonee. After a short career in business I returned to studies at York University and Trinity College, Toronto. Two summers as a student chaplain in Prison ministry led to involvement in reintegrating former inmates into the community after I was ordained. During my years in rural ministry I founded the Toronto Parish Training Program and directed it for the next 10 years. My interest in Ecumenical Ministry was focused in the challenge of founding a Church Campus Ministry in Mississauga involving 4 denominations, and serving as founding rector of its Anglican Component – St. Francis of Assisi. During those same years I founded the Peel Cheshire Home for the physically disabled. I worked with Provincial and Federal Governments to change legislation, and ultimately served as Vice Chairman of Cheshire Foundation Canada. In East York the issue in which I became involved was poverty – founding the Deacon’s Cupboard Food Bank, and working to establish affordable housing. Early family history makes me no stranger to personal tragedy. In that, I found the friendship of Christ and the nurture of the Church to uphold me. No doubt that accounts for my particular concern for all those who live at the margins of society. Travel in Africa, Jamaica, Haiti and elsewhere has served to reinforce that concern. For personal relaxation I spend time in my workshop and in the garden. My wife and I enjoy working together in the kitchen to prepare meals for family and friends. The ministry of hospitality has always been a priority for us. My greatest support through 35 years of ministry has been Lois, my wife of 44 years, and our son David, now a teacher and housemaster at an Anglican boarding school on Vancouver Island. He and his wife, Jillian, have just blessed us with our first grandchild, Jessica Susan. The ministry of the Primate, and the expectations and constraints that impinge upon it are hard to imagine, and the learning curve will be steep for any new Incumbent of the office. The fact that the Primate is elected by laity and clergy from every part of the Anglican mosaic in Canada brings with it an awesome sense of accountability and responsibility. The Primate is the servant of the whole Church, and is both an agent and symbol of its unity. He or she carries the Canadian Church to the rest of the Anglican Communion and to the ecumenical family of churches. The Primate is called upon to be the voice of the Church to the society and to leaders of government. He or she presides over the General Synod that sets the agenda for the Church, and over the Council and committees, and the national staff that brings that agenda to realization. His or her ministry of unity is exercised primarily in relation to the Metropolitans and Bishops of the Church. Servant leadership in the present context I believe involves careful listening to the concerns of a wide diversity of views on divisive issues in the Church. Upheld by the prayers of the whole Church, the Primate will exercise leadership in finding an expression of our diversity that maintains the fullest possible expression of our unity in Christ. There will be a number of important changes in the staff of General Synod in the new triennium, a move to new national headquarters, and a new framework for the mission and ministry of the Church adopted by General Synod. Indeed the Lord is “making all things new.” The new Primate must assure that these outward changes signal a renewal of spirit and of our mission to the world in the name of the Risen Christ. It is that mission to a world in crisis that must be uppermost in our minds. Internal division must not distract us from the proclamation of good news in Jesus Christ, and our commitment to God’s kingdom of justice and peace.